Oliver’s Story: It was October 2017 and my husband was getting our 2-year-old son, Oliver, ready for bed. He shouted for me, saying “Jo, come look at this!” I felt sick as soon as I saw it. By laying directly under the ceiling light in his bedroom I could, what I can only describe, as ‘see through’ the pupil of Oliver’s right eye. I could see a thick white mass. I panicked and broke down in tears. I had read about retinoblastoma in several magazine articles. It’s the first thing that came into my head. Then, I remembered when we had picked Oliver up from nursery a few days prior, one of the nursery nurses had commented that he struggled to be focusing with that same eye. At the time, we were resolved to just monitor it, as we hadn’t noticed anything ourselves, and after chatting with his keyworker, she hadn’t either. I remember ringing my mum crying, so worried that something was really wrong. I couldn’t wait until morning to see a GP, so we rang NHS direct. We were booked into the out-of-hours service at the RVI in Newcastle that night. I could tell by the look on the doctor’s face he was worried. He told us to come back first thing the next morning to the eye department. We were seen straight away. That day was a whirl wind. I had also just found out I was pregnant, and after a miscarriage only a few months before, my head was all over the place. The nurses in the hospital were amazing, one in particular stayed with us all day. Made sure I ate, drank and got some rest. She also came in with us when the consultant said, that after undergoing an examination under general anesthetic, he was concerned that there might be a chance of retinoblastoma. The ultrasounds were showing a mass and his retina was completely detached. It was advanced. Thankfully, that nurse stayed with us and asked the consultant all the questions I was too shocked and upset to ask at the time. He told us at this point that it was unlikely he could see out of that eye and that he would unlikely get it back. We were referred to a specialist down a Birmingham Children’s Hospital and traveled down the following week. It was here that we were told the news that he actually had Coats’, not retinoblastoma. I cried with relief, but it was in an advanced stage. The fluid that had been leaking was extremely viscous and had therefore shown as a mass on ultrasounds, which is why they had initially thought it was a tumor. We were told again that it was unlikely, after treatment, Oliver would regain vision. But his treatment would revolve around draining the eye and preventing further leaks, which could cause pressure to build up and cause possible pain, which, in rare circumstances may result in the need to remove the eye completely. This was our next battle. 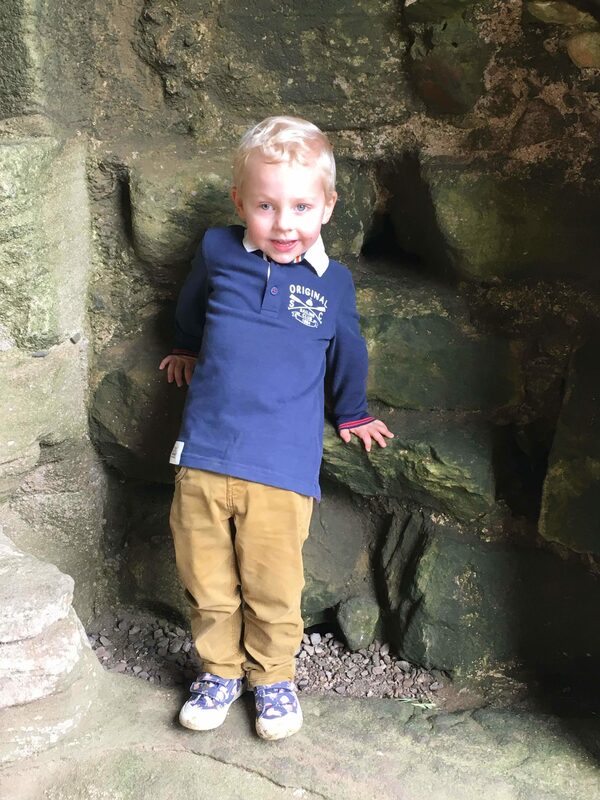 After returning to Newcastle, Oliver needed 2 surgeries to remove the fluid that had leaked, due to its volume and thickness. However, once drained, they were able to almost completely flatten the retina. Oliver had three more laser treatments, each time having an Avastin injection. His last was in April 2018, when I was 35 weeks pregnant. His little brother was born in June. Then, a week after giving birth, we were back in hospital. And for once, good news – no changes! Lots of scarring but no further leaks and his vision in his ‘good eye’ was pretty much perfect. And when working together his vision is great. We took him back for his last checkup in Sept 2018 and again, no changes and no further leaks. He has another appointment in January 2019. If this is the same then we can reduce the frequency of his checkups. I am so proud of our little man, he never lets Coats’ get in his way. He is three now and he can be a little clumsy at times. He forgets he can’t see things coming from his right when running about, so lamp posts and doors can sometimes pose a hazard. But, other than that, you would never know. His eye seems to have retained good muscle memory as it follows the other. The only way you can tell, as an outsider, that there is a problem is that his pupil doesn’t react to light, so looks different than the other in certain lights. He can now tell us he can’t see out of his Coats’ eye, and knows the difference between that and his other. In fact he laughs, he thinks it’s funny. In the back of my mind I always worry about further leaks. The other day he said his eye hurt. I panicked and told my husband I was going to ring the consultant the next day. It was only at bedtime, when Oliver told me it hurt because one of his nursery friends had poked him in the eye, that I calmed down. I always worry about “what if we come to the stage where it can’t be managed anymore and he has to have his eye removed?” How do you deal with that in a child? But we will deal with it, because we will have no choice. And we have dealt with it until now. Oliver has adapted brilliantly and I guess that is the only good thing about it happening so young, he knows no different.